Below are two great video’s that give a good overview of the CTI client and also demonstrates how to setup the Server and Client components of the ZYCOO UC PRO Desktop CTI client. UC Pro is a must have CooVox add-on and a powerful unified communication software suite which allows users a high level of integration, communication and collaboration between their ZYCOO CooVox telephone system and their internal business system. UC Pro‚ allows end users to work more collaboratively and collectively, getting information about callers quickly and efficiently. The UC Pro product suite is not only cost effective but also very easy to maintain and install as you can see in the below video. UC PRO is a CTI (Computer Telephony Integration) product, that designed to help users make optimal use of their telephone system. UC PRO enables full control of your handset from your computer. No need to remember codes for pickup and transfers etc and Integrates with a wide range of CRMs including salesforce, Microsoft Dynamics, Netsuite, vTiger, XING, Zoho, SAGE and other applications including Microsoft Outlook. The first video is sales training which gives a good overall demonstration of the product, focusing on many of the core features. The second video is a technical training video detailing how to set up the UCPRO server and client. 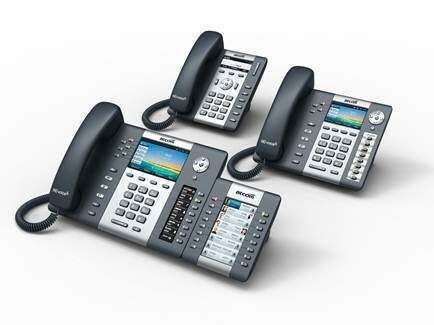 Integrating your telephone system with your desktop PC is a great feature for any business to have. The ability to control and manage your calls via your desktop mouse not only simplifies the use of your phone system but also helps increase productivity. View these and more feature in the video below. Posted in MyBlog | Comments Off on ZYCOO CooVox Desktop Integration. We are pleased to announce that the Zycoo UC510 All in one Router / IPPBX / Wireless Access Point is now in stock and can be found here. The Zycoo UC510 is designed as an IP Office for SOHOs (Small Office and Home Offices). This new solution offers not only a Wi-Fi router, supporting external ADSL, VPN Client/Server, VLAN… but is also a fully featured IP PBX that can host up to 10 extensions with 2 analogue ports connected (PSTN line (FXO) / analogue phone (FXS)), and supports call forward, call recording, blind/attendant transfer, conference and a host of other powerful features. UC510 is configured and managed through a single web GUI which significantly reduces the time and effort required to install the product. This simplified management and reduction in hardware costs through merging two products into one makes the UC510 an amazing and cost effective solution for SOHOs. Zycoo has released firmware version 1.1.0 for their U20 and U50 Coovox IPPBX. The firmware is a combination of fixes and new features. Firmware can be downloaded from the Zycoo website. This patch is only intended for upgrading to CooVox-U20 V1.1.0. Please check details of this release and decide if it is necessary to upgrade your system. CooVox series firmware releases are not cumulative and therefore CooVox must be operating from the previous firmware release e.g. V1.0.5 Patch 2 before upgrading to V1.1.0. A Configuration file is not included in the upgrade so you are not required to backup your configuration before upgrading. If a previous version of backup file is restored after upgrade, it will lead to abnormal GUI functionality. You should however create a new backup file once you have upgraded to V1.1.0. Clear your browser cache to display the firmware version correctly. 1. When flash storage exceeds the defined value, it will be uploaded automatically. 2. Adjusted the maximum silence time to 10s in voicemail.If no voice is detected within 10 seconds then it will be considered to be an invalid voicemail. 3. Fixed audio codec configuration problem in IAX2 protocol. 4. Define the Caller Name as Null when incoming call originates from analog port. 5. Allow the wildcard character to be used in DOD number in the DOD Settings page. 6. Adjusted the number of call logs to save a maximum of 20000 call logs. 7. Fixed a problem where the reboot operation from GUI will fail after restoring a backup configuration that has a different password to the current system password. 8. Fixed a problem preventing auto-detected fax’s being forwarded to an extension from an analog line. 9. Adjusted callback function so incoming calls will be hung up before the line answers(Except PSTN line). 2) GSM module can refresh strength of GSM signal automatically. 11. Fixed a bug where caller ID of recording file is changed to Unknown on the phone in blind transfer. 12. Fixed a BLF problem for analog extension. 13. Fixed a rewriting problem in “Network Settings”, “IPv6 Settings” and “VLAN Settings” pages. 14. Allow an administrator to enable and configure the call forward prompt on Call Forward page (Administrator GUI). 15. Strengthen the recovery function of backup files.It is now possible to choose recovery PBX or network settings when restoring a backup. 16. Adjusted record list to reverse order. The new generated file will be displayed at the top. 17. On the VoIP Trunks page, Auto Fax Detection can now be configured even without authentication. 18. 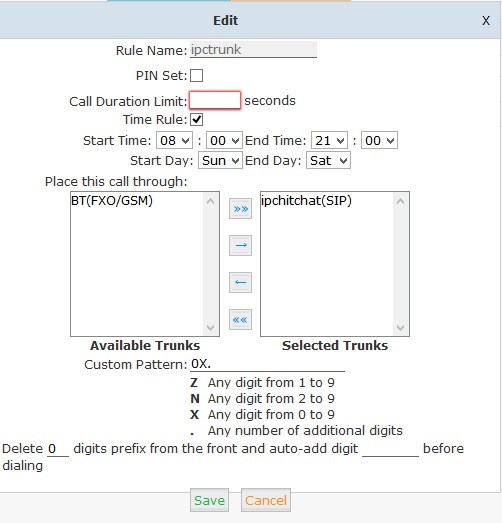 Adjusted the language options to be synchronized with system language in VoIP trunk settings. 19. Removed links to trunk settings on the Operator page. 20. Adjusted the Smart DID page to not allow deletion of the rule when only one smart DID rule remains. 21. Fixed a problem where“$” cannot be used in login password. 22. Resolve a display problem on firewall configuration page with Arabic and Persian language. 23. 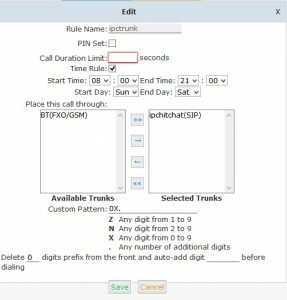 Adjusted VoIP trunk settings so username and certification name can bea maximum of 64 digits. 25. Added “call duration” on “Record List” page (Administrator & Extension User GUI). 26. Added Russian language option in the GUI. 27. Added “Timeout” on IVR page(The maximuminterval time for prompt playback). 28. Added the extension number in destination ID field and also the ring-group or queue the extension is associated with on Call Logs page. E.g. : Extension 806 which belongs to ring-group 640 receives a call from caller 801. 29. Added DST(daylight saving time) to Tehran Time. 30. Added the option “Keep the current network settings” when reset to factory default. 31. Added the option “Ring Timeout” in Global Analog Settings page, which is used to define the time to hang up the call when there isn’t a ring signal before the FXO answers. Caller ID will be sent to the transferred destination when transferring the call. 3) Support auto provision of Hanlong IP Phone UC860P, UC842, UC802P, UC840P, UC804P, UC806P (Default is PnP, also support TFTP(DHCP Option66)). Zycoo has today released firmware version 1.0.5 Patch 2 for their U20 and U50 CooVox Series IPPBX systems. Patch 2 is a combination of new features and bug fixes. If you are using BRI and/or IAX protocol then this release fixes some memory leak issues identified by a number of customers so is worth applying for this alone. 2. Support Auto-Provision feature for Akuvox and Escene phones. 3. Added search method based on caller/callee number on record list page. 4. Recording list can be paged. 7. Added fax list page for both admin and extension user web GUI. Firmware notes – This patch is for upgrade CooVox-U20, U50 V1.0.5 only. If your firmware version is lower than V1.0.5, please upgrade it first to V1.0.5 patch 1 level and clear the browser cache to display the firmware version correctly. Firmware Version 1.0.5 Patch 1 for the CooVox range is available for download from the Zycoo Website. The patch is mainly bug fixtures but their are a few new features as well. One being the ability to select ‘allow guest’ from within the GUI. This was a feature which we had requested as many UK Sip providers send inbound unauthenticated calls from various different ip addresses which results in the pbx dropping the calls as unauthorised. Zycoo has released version 1.0.5 firmware for their CooVox Series of business phone systems which is now available for download from Zycoo’s website. The firmware is free and is an accumulation of bug fixes but also includes some nice new features as well. One enhancement that is welcome for our UK and European customers is the ability to select P2P and P2MP from the GUI for customers with BRI lines. Previously these changes needed to be made in the underlying configuration files. Another new feature that we really like is the ability to set time rules on outbound calls. This a great security feature as most toll fraud tends to happen in the early hours of the morning so the ability to restrict calls during these times is a great feature to have. The image below shows how this feature has been implemented. The update has two files and both must be updated using TFTP (we use the free tftpbood.exe) Also use firefox to access the GUI. Log into GUI and refresh browser and it should say version 1.0.5 on home page. Atcom has now produced samples of their new phone range with the first production run expected at the end of March 2014. Originally branded as the AT900 series, the new line up has adopted the name Rainbow series. The first two models to appear will be the Rainbow 1 and Rainbow 2. Rainbow 2 pictured below is the entry level model and supports 1 x SIP account, has power over ethernet functionality and can be Desk or wall mounted. A 1S version will follow shortly which has Gigabit ethernet connectivity. The Rainbow 2 pictured below is the second model in the series and adds support for 4 SIP accounts and again will soon be accompanied by a Gigabit ethernet 2S version. All in all, the Rainbow Series is visually a massive improvement over the current AT800 series and we are looking forward to putting the product through some rigourous testing. We are even more excited to see the colour versions within the series, namely the Rainbow 3 and Rainbow 4 when they are released. Watch this space. Atcom has released version 3.0 firmware for their IP0x series IPPBX’s. The firmware is available for download on Atcom’s website. 1. FaxToEmail ( only IP01/02 support currently). 3. Enhanced auto provisioning for PhoneBook , Firmware, Ringtone. Atcom has released the first pictures of the new AT9xx range of IP Phones. We are expecting the first models from this range to be available early next year.